This standard applies to circuit-breakers, the main contacts of which are intended to be connected to circuits, the rated voltage of which does not exceed 1000 VAC or 1500 VDC. ; it also contains additional requirements for integrally fused circuit-breakers. Changes in dependability needs and technologies have led to a marked increase in standard requirements for industrial circuit-breakers. Conformity with standard IEC 947-2, renamed IEC 60947-2 in 1997, can be considered as an ‘all-risk’ insurance for use of circuit-breakers. This standard has been approved by all countries. the general rules IEC 60947-1, that group the definitions, specifications and tests common to all LV industrial switchgear. the product standards IEC 60947-2 to 7, that deal with specifications and tests specific to the product concerned. 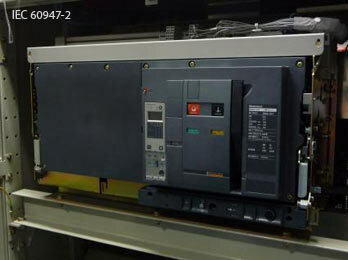 Standard IEC 60947-2 applies to circuit-breakers and their associated trip units. Circuit-breaker operating data depend on the trip units or relays that control their opening in specific conditions. their classification: utilisation category, suitability for isolation, etc. The standard also draws up series of conformity tests to be undergone by the circuitbreakers. These tests, which are very complete, are very close to real operating conditions. Conformity of these tests with standard IEC 60947-2 is verified by accredited laboratories. category A circuit-breakers, for which no tripping delay is provided. This is normally the case of moulded case circuit-breakers. These circuit-breakers can provide current discrimination. category B circuit-breakers, for which, in order to provide time discrimination, tripping can be delayed (up to 1 s) for all short-circuits of value less than the current Icw. This is normally the case of power or moulded case circuit-breakers with high ratings. For circuit-breakers installed in the MSBs, it is important to have an lcw equal to lcu in order to naturally provide discrimination up to full ultimate breaking capacity Icu. The setting data are given by the tripping curves. These curves contain some areas limited by the following currents. In (in A rms) = maximum uninterrupted current withstood at a given ambient temperature without abnormal temperature rise. Id is given for a conventional tripping time. For a current greater than ld, tripping by thermal effect will take place according to an inverse time curve. Ir is known as Long Time Protection (LTP). or instantaneously (similar to instantaneous protection). 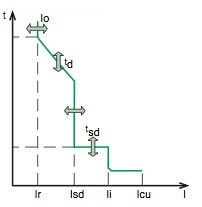 Isd is known as Short Time Protection or lm. Ii (in kA) is given as a function of ln. It characterises the instantaneous short-circuit protection for all circuit-breaker categories. For high overcurrents (short-circuits) greater than the li threshold, the circuit-breaker must immediately break the fault current. This protection device can be disabled according to the technology and type of circuit-breaker (particularly B category circuit-breakers). Icm (peak kA) is the maximum value of the asymmetrical short-circuit current that the circuit-breaker can make and break. For a circuit-breaker, the stress to be managed is greatest on closing on a short-circuit. 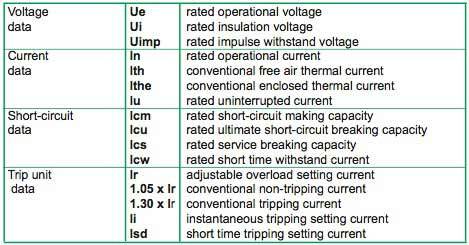 Icu (kA rms) is the maximum short-circuit current value that the circuit-breaker can break. It is verified according to a sequence of standardised tests. After this sequence, the circuit-breaker must not be dangerous. This characteristic is defined for a specific voltage rating Ue. Ics (kA rms) is given by the manufacturer and is expressed as a % of Icu. This performance is very important as it gives the ability of a circuit-breaker to provide totally normal operation once it has broken this short-circuit current three times. The higher Ics, the more effective the circuit-breaker. Icw (kA rms) is the maximum short-circuit current that the circuit-breaker can withstand for a short period of time (0.05 to 1 s) without its properties being affected. This performance is verified during the standardised test sequence. (*) These data are defined for a specific voltage rating Ue. The term coordination concerns the behaviour of two devices placed in series in electrical power distribution in the presence of a short-circuit. This consists of installing an upstream circuit-breaker D1 to help a downstream circuit-breaker D2 to break short-circuit currents greater than its ultimate breaking capacity IcuD2. This value is marked IcuD2+D1. IEC 60947-2 recognises cascading between two circuit-breakers. For critical points, where tripping curves overlap, cascading must be verified by tests. This consists of providing coordination between the operating characteristics of circuit-breakers placed in series so that should a downstream fault occur, only the circuit-breaker placed immediately upstream of the fault will trip. if the fault current is greater than this value ls, both circuit-breakers D1 and D2 trip. Just as for cascading, discrimination must be verified by tests for critical points. Discrimination and cascading can only be guaranteed by the manufacturer who will record his tests in tables. It draws up a series of very complete tests representative of circuit-breaker real operating conditions.